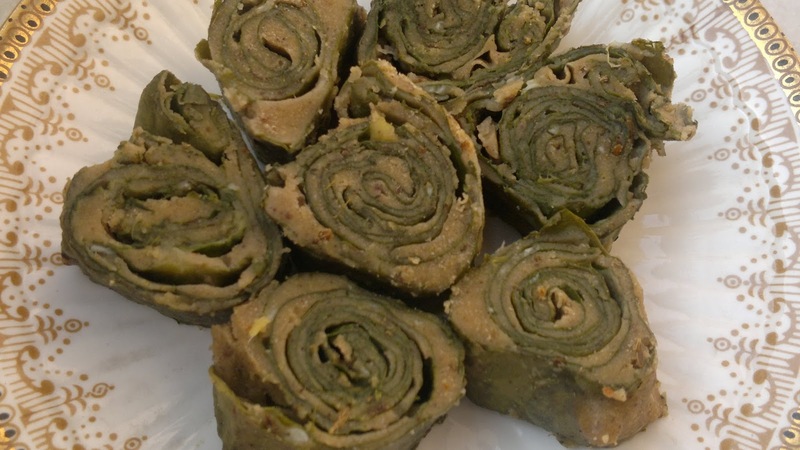 Patod is a very healthy and interesting rainy season snack recipe. Pakode usually means deep frying but not always… Arbi ke patte or colocasia leaves are used to make steamed pakodas which are not only tasty but very very healthy too. As there is no fatting substance being used, all ingredients are simply healthy. 1. Wash and clean the arbi leaves. Cut out the stems and remove the hard veins from the leaf. 2. In a bowl make a thick paste of besan and water. The consistency should be thicker than usual pakoda batter. Ensure there are no lumps in batter. Add all spices and ginger garlic paste in the batter. 3. Spread this thick paste on a leaf of arbi. The spread should not be very thin, rather it should be a thick layer of besan batter. Top it with another arbi leaf and spread another layer of the batter. Top it with third layer of leaf and again spread the batter. So 3 leaves makes 1 roll. Start rolling the arbi leaf from one side till we get a complete roll of leaf. Seal the roll with the help of tooth prick. This roll with look like spring roll. Prepare another roll in similar manner. 4. Heat water in a steamer and keep these arbi leaf rolls for steaming for 10 min. 5. Once cooked, cut small pcs of patod and serve with chutney. 6. You can also sauté this patod pcs, but it is purely optional.